Photo courtesy of David Hayden. David Hayden has been a member of the Water Environment Federation (WEF; Alexandria, Va.) and Santa Ana River Basin Section of the California Water Environment Association (CWEA) since 1992. 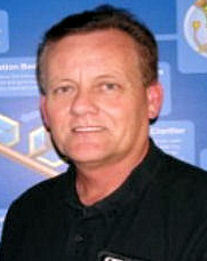 He is a Grade III operator in California and was recognized as CWEA Operator of the Year in 1992. 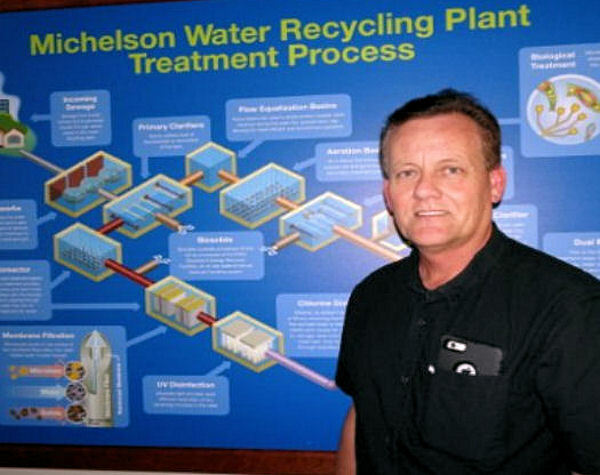 As a Grade III operator, I have served the public for more than 35 years, treating and supplying safe, recycled water to the Irvine (Calif.) Ranch Water District community. After stumbling across the description of the Water Environment Federation (WEF; Alexandria, Va.) #MyWaterLegacy social media campaign, which highlights and celebrates the important work of water professionals, I became inspired. I started thinking about my own contribution not only to my family and friends but also to those in my profession. When I started my career in 1981 as an operator-in-training, my district’s “forefathers of water treatment” left a newly built 57 ML/d (15 million gal/d) activated sludge plant. After my years of service, I can return the favor by handing over a newly upgraded biological nutrient removal (BNR) process and a new membrane bioreactor (MBR) facility to the next generation of wastewater operators. When I began my career, we were treating 23 ML/d (6 million gal/d). District staff also thought our facility had the greatest computer system because it featured a supervisory control and data acquisition (SCADA) program with a single alarm — consisting of an old-fashioned horn — for the entire facility. As time marched forward, we upgraded first to a dialer system connected to a phone the size of a brick, then to pagers, then to computer systems. Today, we have increased treatment to 68 ML/d (18 million gal/d) with a capacity of 125 ML/d (33 million gal/d), and we have a full SCADA system linked to smart phones and tablets that can run the entire facility from the palms of our hands. David Hayden, a Grade III operator, has worked to treat and supply safe, recycled water at the Irvine (Calif.) Ranch Water District for more than 35 years. Photo courtesy of Hayden. In 2017, the state of California celebrates 100 years of using activated sludge. 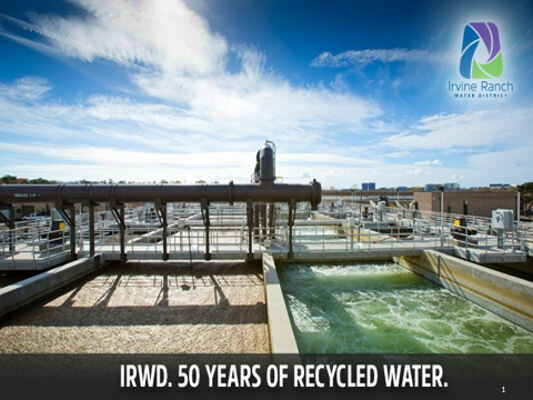 We have come a long way from primitive activated sludge processes of the past to the advanced BNR and membrane treatment processes of the present. Water sector professionals have many levels of responsibilities. We are responsible for preserving, enhancing, and restoring the quality of California’s water resources for the protection of the environment and public health, as well as other beneficial uses. We need to ensure proper water resource allocation and efficient use for the benefit of current and future generations. We also must comply with the demanding regulations of our states. In my case, we must meet regulations set by the California State Water Resources Control Board, which has some of the highest standards in the country. And it turns out that mom was right; honesty is the best policy, especially when reporting to the state or any other regulatory agency. Self-reporting to these agencies reflects the honesty of water professionals. This brings me back to a time when I taught an Environmental Science Merit Badge course to young Boy Scouts and told them to be honest even when no one is around. This quality found in wastewater professionals is something I have instilled in my own children. Hayden’s water legacy has been passing along knowledge to a new generation of wastewater professionals. Photo courtesy of Hayden. I have read that almost a third of wastewater utility workers will retire in the next 10 years. We must ask ourselves if we are prepared to train the next wave of wastewater utility operators. The next generation will be expected to operate our high-tech and complex WRRF processes. It is important for those of us who will soon be retiring to pass on our knowledge to this younger generation. asking operators to explain how water travels from one unit process to another. I consider my personal water legacy to be the knowledge I have passed on to the many young people entering our sector whom I have encountered in my career. I still have people come up to me, asking if I remember when they came through Irvine Ranch as a student from a Rancho Santiago Community College (Santa Ana, Calif.). Many have gone on to become wastewater professionals, so the cycle continues. As a member of WEF and the Santa Ana River Basin Section of the California Water Environment Association (CWEA) for the past 25 years, I have found that these organizations are a great way to give back to the younger generation. I have participated in different training events such as Operations Challenge. The competition inspires the best from many different disciplines to compete and brings our sector, filled with highly qualified individuals, to the forefront for recognition. Water sector veterans can explain to the next generation how training such as Operations Challenge relates and elevates the sector. And we can describe how the five events of the competition — safety, collections, laboratory, process control, and maintenance — directly relate to the water sector. The #MyWaterLegacy social media campaign and WEF Highlights articles feature the accomplishments and contributions of members who have passed down the tradition of actively participating in WEF and working in the water sector. The WEF Legacy Family will appear in an ongoing WEF Highlights series. Read the series by searching for the keyword MyWaterLegacy. Do you know of a family with multiple generations of WEF members and water sector professionals? Contact Jennifer Fulcher, WEF Highlights editor, at jfulcher@wef.org.